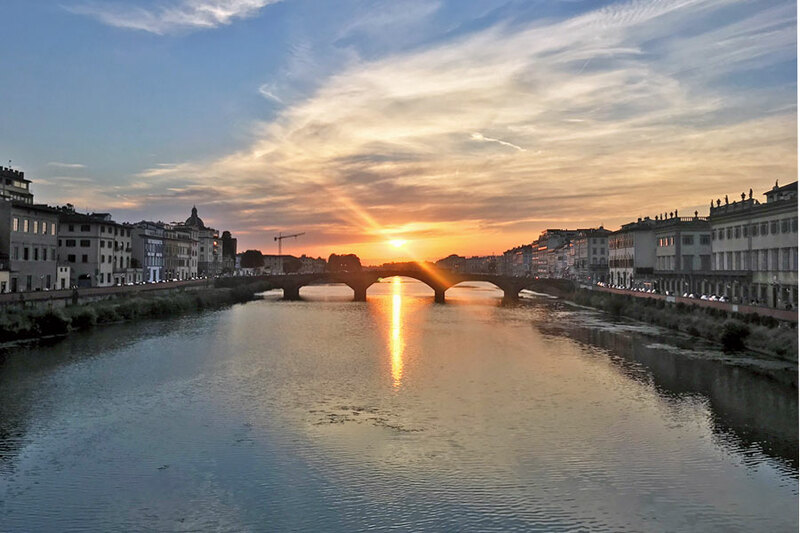 I enjoy watching the sunset from different locations in Florence, but my favorite spot is Ponte Santa Trinita. 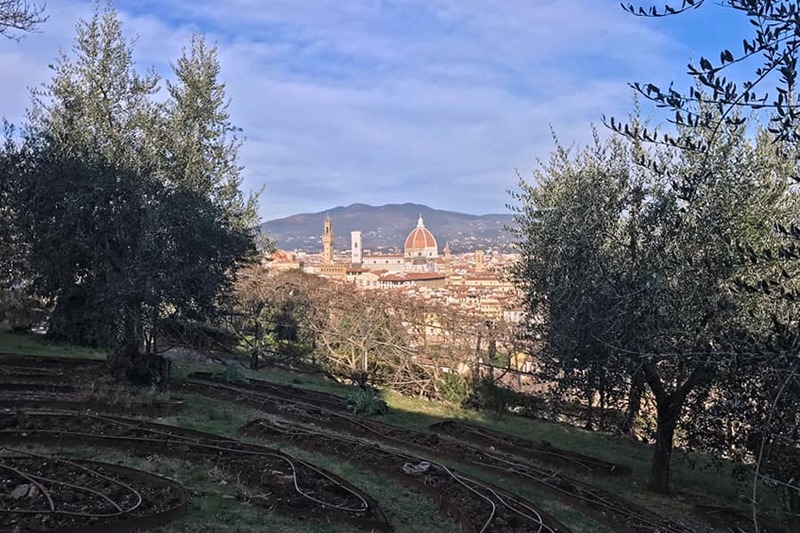 I particularly love the expansiveness of the sky and the way the city hugs the Arno on both sides. 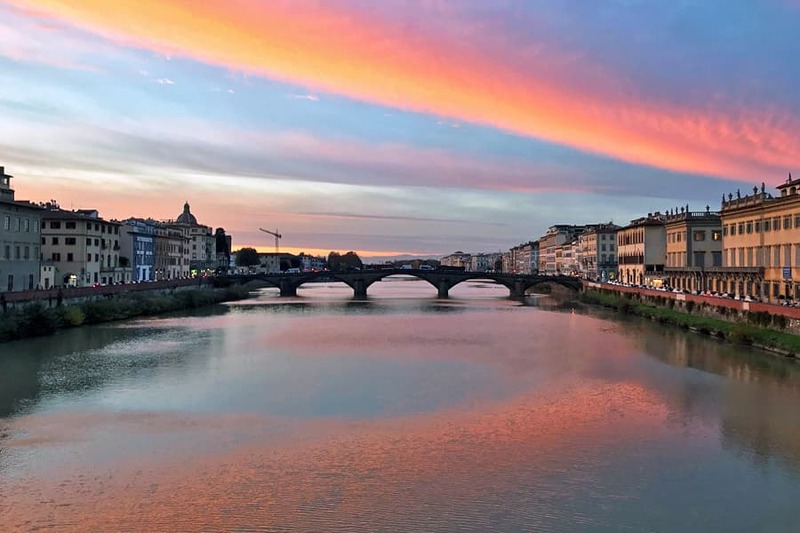 When the wind has died down, I especially love how the Arno is like a mirror that perfectly reflects the city and sky above. While it usually takes time and patience to take a good photo, it takes even more of both to capture a photo to represent that day’s sunset. I’ve seen enough sunsets now to know that there is no best time to admire a sunset. Sometimes, the light is lovely before the sunset while at others times it’s during or even afterwards during the blue hour. The first thing I do when I decide to go watch the sunset is check the Weather app on my iPhone so I can leave my place at least an hour before the official sunset time. When I reach my favorite spot on the Ponte Santa Trinita, I face west. I enjoy admiring the sunlight glistening on the river, the birds flying overhead, the cool air whipping past me, and the boats gliding along the river below. Once in a while, large fish come up to the surface of the water allowing ripples to appear. Sometimes I take a break and sit down to look at the Ponte Vecchio. 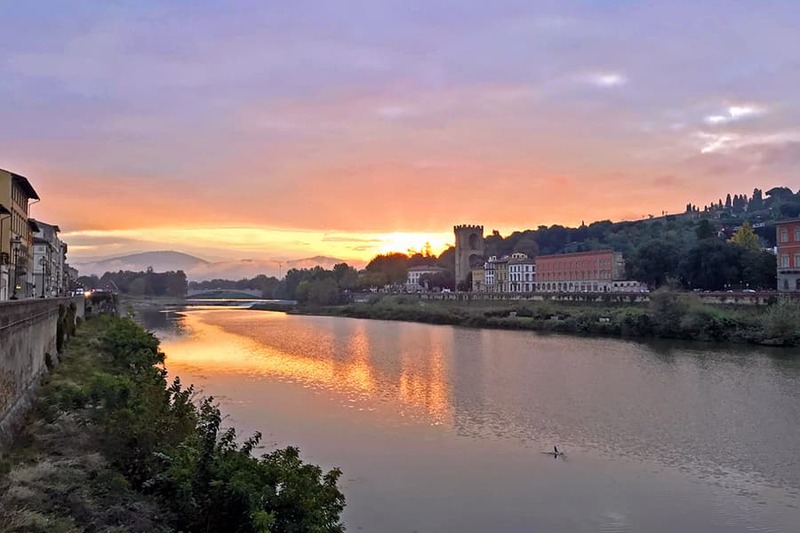 It always makes me smile when I see people passing by in cars, bicycles, or even motorini who quickly look in both directions to admire the beauty from the ponte. 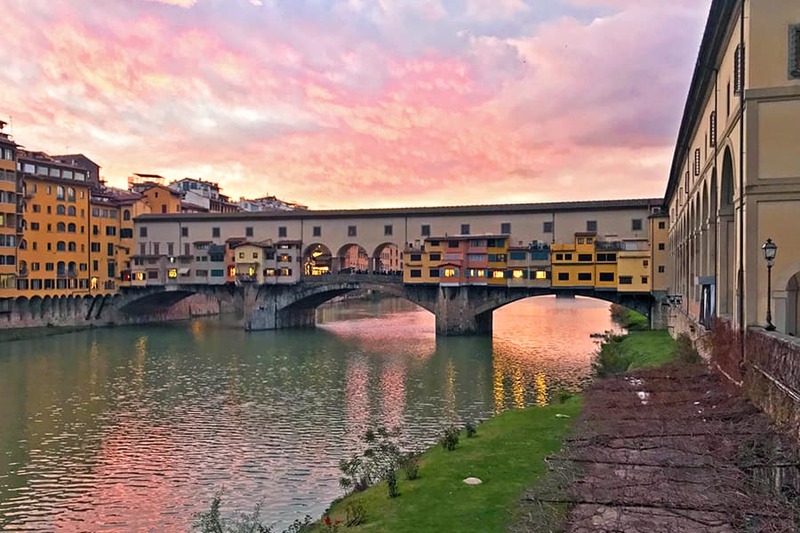 It’s fascinating to see how the sunlight is reflected on the clouds above the Ponte Vecchio and how the sunlight bounces off the windows of the buildings on the Ponte Vecchio. Sometimes I find it difficult to leave the ponte after the sun has set. I usually end up staying longer so I can witness the blue hour. 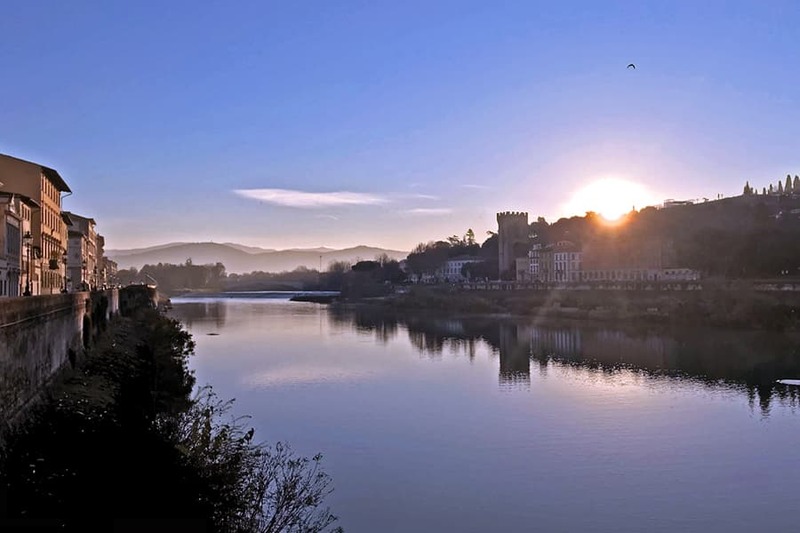 I enjoy watching the sky become a deeper blue and love it when the lampposts along the Arno get turned on and outline the wall along the Arno. With each step I take to return home, I feel rejuvenated. My heart is lighter and my spirits are higher. I love how the beauty of a sunset is tucked inside my heart. 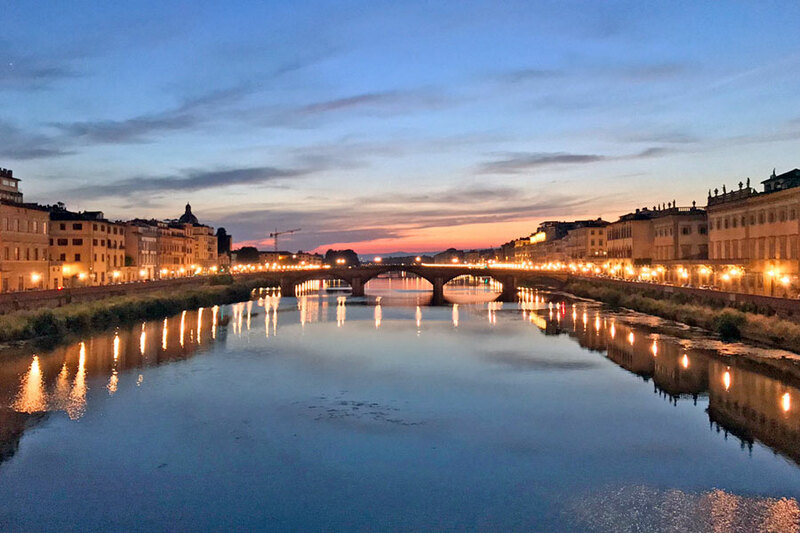 I could never tire of watching a sunset in Florence and even look forward to watching them in other locations as well. It’s such a gift to watch the day end so beautifully and have a photo to commemorate it. 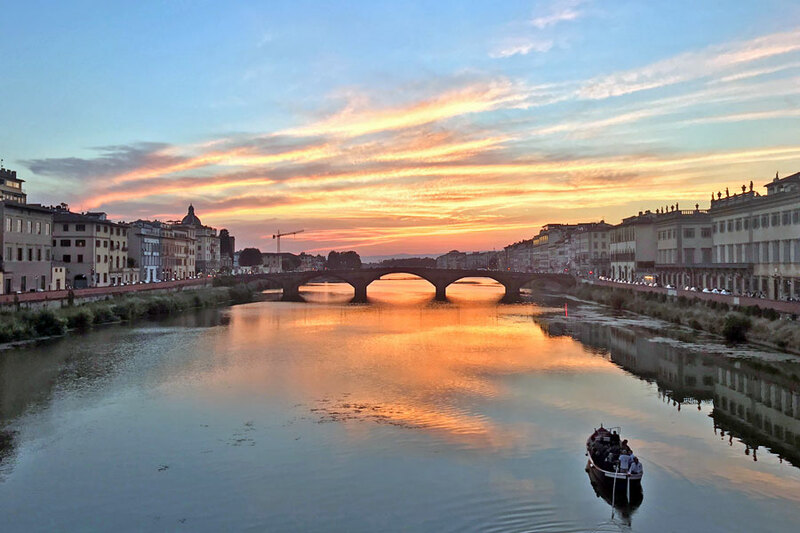 Note: I took these photos in August to show the evolution of one sunset from Ponte Santa Trinita.